Commercial grade free Open Source Point of Sale software. 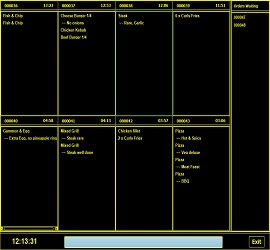 Remote kitchen screen, allows orders to be sent from the POS to remote food preparation areas. 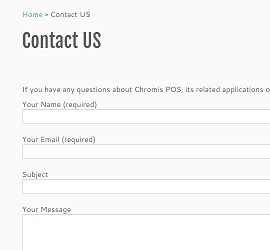 Contact Chromis or leave your comments here. 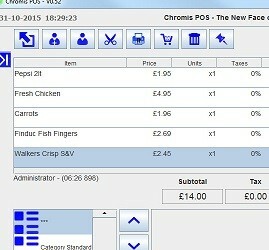 Welcome to Chromis.co.uk, this site is dedicated to Chromis POS & any other Chromis associated open source POS application. Following on from my extensive work in supporting an open source pos with a large number of additional features and fixes since 2012, there seemed to be a demand for a cheap kitchen screen option to work with the software. It was then, that I have decided to start developing additional applications as extensions to this open source application, or any other open source POS software that could be adapted to use the Kitchen Screen. This was released in July 2015. That was the birth of Chromis as a product. The kitchen screen module was released in July 2015, and was written to work originally with Unicenta. From following the forum, it became apparent a large number of the Unicenta POS users were becoming dependent upon my changes, and these needed to written again, with each new release of the software, as they were not included in the release, this became very frustrating and costly in man hours. So, I decided it was time for a change, the decision was made to create my own fork of what was previously Openbravo POS and Unicenta oPOS. This enables me to spend time looking at new features and bug fixes, rather than revisiting the same features each time. The applications will be released as open source, with the applications released on the SourceForge platform and Github used for the source code. Whilst there is no fixed development team apart from myself at this moment in time, I will be using Github and pulling in any changes submitted by users that I feel will benefit the majority of users. The source code will be pushed to Github at the same time as the new binary is released. Over time other applications will be added to the Chromis product range, but the first of these was the Kitchen screen, then the ChromisPOS. All the applications will be made available with dedicated installers for Windows, Mac OSx and Linux. The exception to this, is the Kitchen screen, as it was felt the chances of an Apple being used in that type of environment was unlikely due to its cost.